We are pleased to announce the following IGNs as our Embertember Weekend Raffle Winners! 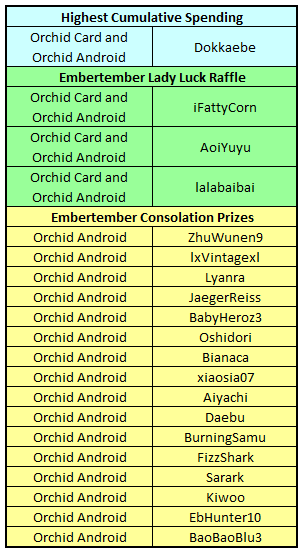 Four lucky winners walk away with Orchid Cards and Orchid Androids, and 16 other lucky people get an Orchid Android for themselves! Redemption codes for Orchid Cards have been sent to the winners' respective registered email address. Redemption codes for the Consolation Prizes winners will be sent out within the week. Crediting of the 5% Ember Rebate will be done in a later server maintenance in the v179 update. Join us in a special Ember September Weekend with great rebates and yet another chance to get on Lady Luck's good side to obtain an Orchid Card! We will also be offering a special rebate for everyone who spend on the cash shop this weekend! Simply spend at least 50k @cash in the cash shop to be eligible for a 5% Ember Rebate in return! In conjunction with this special Ember Rebate, for every 20k @cash spent, each player will be entitled to 1 raffle chance for the Orchid Card. There will be 3 Orchid Cards to be given away, and there is no limits to the amount of raffle chances you can obtain! Orchid Card is part of the Sad Soul set, which can be used in our card collecting event, Maple Mania, with many attractive prizes to be won! Would Lady Luck favour you? On top of that, the person with the highest cumulative spending across the weekend will walk away with an Orchid Card and an Orchidroid! Note: All spending will be based on user's registered Asiasoft Passport, cumulative of all Maple IDs in the same passport. Players who have made successful purchases eligible for the rebate will receive 5% of their total spending as rebate in the form of Maple Points, to be credited during Server Maintenance in v179. Players must ensure that their email addresses stated on their Asiasoft Passport account is active and accurate. Asiasoft Online Pte Ltd and Nexon Korea Corporation will not be held responsible in cases of lost email, or cases whereby the participants cannot be contacted via their registered email addressed tied to their Asiasoft Passport account. Asiasoft Online Pte Ltd and Nexon Korea Corporation reserves the rights to make any changes to the above mentioned without any prior notice. Asiasoft Online Pte Ltd and Nexon Korea Corporation reserve the right to disqualify and take action against any player that violates our abuse policy.